The Central African Republic has been beset by violence since December 2012, when a coalition of Muslim-dominated rebel groups, led by Michel Djotodia under the Séléka banner, moved through the country to eventually drive out President Francois Bozizé in March 2013. Djotodia took control of a transitional government, but lost control of Séléka soldiers, who engaged in widespread killing of civilians, burning and looting of homes, and other serious crimes in which Christians were specifically targeted, while Muslims and mosques were largely spared. Human-rights watchdog groups reported Séléka militants had killed hundreds of people and had driven tens of thousands from their homes. 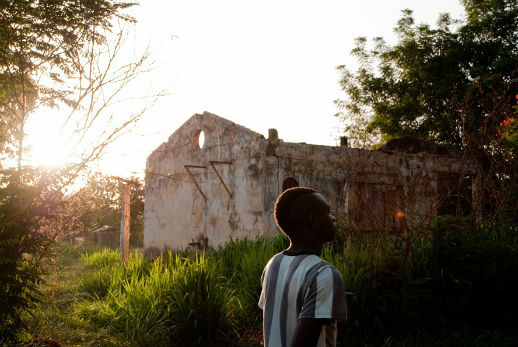 Djotodia formally disbanded Séléka in September 2013, but rebel violence continued and throughout 2013 was increasingly met by the rise of self-defense forces, called anti-Balaka. The African Union, European Union, and France deployed in and around the capital, Bangui. Fearing “genocidal interfaith civil war,” in October the leaders of the country’s 4 million Christians issued a joint statement declaring the military assistance ineffective, and called for a more robust international response. The United Nations sent a peacekeeping force in April 2014 and in September, the U.N. Multidimensional Integrated Stabilization Mission in the Central African Republic had assumed command over the regional military units, a 10,000-soldier force. Djotodia resigned in January 2014, replaced by the Parliament-appointed Catherine Samba Panza as interim president. Anti-Balaka continued a revenge campaign of ethnic cleansing in the west of CAR, forcing Séléka to retreat to the northeast. Many hundreds of Muslims, as well as non-Muslims, were killed, and tens of thousands fled. In July 2014, the armed groups signed a peace agreement in Brazzavile, the capital of the neighbouring Republic of Congo. Fighting now is mostly “within and between the militias for land and resource control,” the U.S. Commission on International Religious Freedom said in its 2015 Annual Report. The country is largely partitioned between Christian and Muslim populations; Anti-Balaka continue to dominate the South and West, while Séléka elements, with the ethnic Fulani and others, dominate the North and East. Tensions between the two have been exacerbated by the power vacuum outside the capital, where UN peacekeeping troops are less prevalent, and beyond the reach of the interim government. Battles between the two movements have been holding local populations hostage.